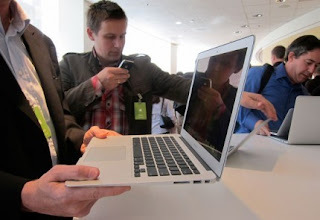 Buying Laptops online or offline has always been a subject of extensive research. We did some homework & here's a list of the most important questions to guide you through an easiest way to buy Laptop. What kind of laptop is right for me? What to look for: Duo core or i3 processor, At least 1GB of RAM; 160GB or larger HDD; 14, 13-inch or smaller display. One can consider a netbook if willing to compromise on the screen size and low processing power. What to look for: Duo core or i3 processor, 2GB to 4GB of RAM; 320 GB or larger HDD; 12- to 14-inch display; Windows Vista Professional or Windows 7 Professional; optional mobile broadband modem. What to look for: 2GB to 4GB of RAM; 250GB or larger HDD; 14, 15.6 to 16-inch display, HD graphics; DVD burning optical drive. What CPU should I look for? The single most important component in your laptop is its central processing unit, or CPU. Essentially the brain of a computer, this processor has a huge impact on what applications you can run, how smoothly they run, and how many you can run at the same time. The two biggest players in the CPU arena are Intel and AMD. Of those, Intel's CPUs comprise the lion's share of the market currently. Most laptops currently have dual-core CPUs, such as Intel's Core 2 Duo. Low-cost Netbooks, however, use single-core CPUs, such as Intel's Atom. PC experience available to everyone. Start here for visibly smart performance. Core i5: The 2nd gen Intel® Core™ i5 mobile processor delivers more performance automatically and a better visual PC experience built-in. That’s visibly smart performance with a boost. Core i7: Intel's newest line of mobile CPUs adopts the high-end graphics/gaming performance of the desktop Core i7 line, and is expressly for those who want top-end power--namely, hard-core gamers and those who prefer desktop-level graphics processing power. The Core i7 Mobile series has better power management than its desktop cousins, but they still draw more power than other laptop CPUs, and will generally be found only in larger desktop replacement laptops. Core 2 Duo: This is Intel's ubiquitous mainstream processor, which comes in a variety of designs based on processor speed and manufacturing size. A newer line of Core 2 Duo CULVs (consumer ultralow-voltage processors) have slightly slower performance, but allow for longer battery life, and are showing up in new ultrathin laptops, where space, cooling, and battery life are key issues. Atom: Intel's entry-level single-core processors are found primarily in the popular Netbook category. Their limited performance is best for simple, single-task computing such as e-mail, basic Web browsing, and office document work. They're fine for low-expectation budget computers, but are unable to play most games or HD video. Common Atom chips include the N270 and the N280, and you should generally avoid the slower Z-series Atoms, intended more for handheld mobile devices than laptops. Revisions to the Atom line are due in early 2010. Core 2 Quad: As the name implies, these are four-core processors that excel at multitasking and computing that requires running multiple apps at once. Core 2 Solo: Some of Intel's ultralow-voltage processors (ULVs) still have only a single core. These sit somewhere between the Atom and the dual-core ULV CPUs. They're often seen in ultraportable laptops that aim for small sizes and good battery life but leave our mainstream features such as optical drives. While these chips are a small performance step up from the Atom, the price premium asked for them makes us suggest holding out for a dual-core ULV processor. Pentium Dual-Core: Multicore CPUs that don't qualify for the Core 2 Duo tag are marketed as Pentium Dual-Core. We've seen these in very inexpensive mainstream laptops, and they're a good value if you need a dual-core 14- or 15-inch laptop for less than $600. AMD Athlon X2 Dual-Core: AMD's alternative to Intel's Core 2 Duo processor amounts to an affordable budget alternative in mainstream laptops, but we've found that Intel CPUs consistently perform better in similarly priced systems. This has not always been the case, and these two companies have swapped the top performance spot more than once over the years. AMD Athlon Neo: Found in thin-and-light notebooks and Netbooks, the Neo is one of AMD's newer processors. It favors long battery life and low power consumption, similar to Intel's Atom processor. Unfortunately, the systems we've seen with the single-core Neo have been more expensive than Atom Netbooks, with very little performance boost. The new X2 version of the Neo is a dual-core part, and has some potential. AMD Turion X2: This is AMD's low-power-consumption version of its mainstream laptop CPU. What type of storage and drives do I need? Hard drive :Traditional HDDs provide basic, inexpensive space to save programs and files indefinitely--or at least for the life of the drive. This type of "spinning platter" hard drive, which is the standard for both desktop and laptop PCs, has grown steadily in capacity, and now laptops can be found with drives up to 1 TB or 1000GB in size. Be warned that capacity alone does not make a good hard drive. The hard disk's rotational speed also makes a big difference; a 7,200rpm notebook disk delivers significantly faster performance than a 5,400rpm model, though a faster drive may also shorten your laptop's battery life. SSD drives, or solid-state drives, have no moving parts, and, unlike traditional hard disks, are less likely to be physically damaged by movement, and generate little or no heat. They are similar to the SD cards found in digital cameras and other devices, or the internal memory in the iPhone, PSP Go, and other portable devices. Keep in mind that SSD drives are more expensive and usually offer smaller capacities than HDD storage. In terms of performance, they offer hypothetical advantages, but in real-world terms, the results are a mixed bag. When getting a hard drive, it's always good to get more than you might think you need. Optical drives: While nearly every laptop used to have a CD/DVD-burning drive not so long ago, today many Netbooks and thin-and-lights don't include an optical drive at all. They're still useful for installing software from a disc, burning backups of media, and importing music CDs, as well as for playing DVDs, of course, but with downloadable media growing in popularity, optical drives aren't quite as appealing as they once were. Blu-ray drives, which can play back high-def Blu-ray movies, are being incorporated into higher-end multimedia notebooks, but make sure the laptop has a 1080p resolution screen (1,900x1,080) capable of playing back Blu-ray content at full quality. External drives: External drives--storage and media-burning options that hook up to your notebook via USB, FireWire, or eSATA cables--come in many shapes and sizes, and can be traditional platter hard drives, SSD storage drives, or even outboard optical drives. Also note that USB-connected flash-memory thumb drives are becoming so cheap and compact that buying one or two for backup and extra storage space is nearly an impulse decision. Having a thumb drive on your keychain is a great way to transfer data to and your PC. Indiaplaza (www.indiaplaza.com) pioneered internet retailing and e-commerce in India in 1999 and is the leading online shopping destination for Indians worldwide. The website retails over 7 million items across books, music, movies, electronics, cameras, mobile phones, jewellery, apparel, CD-ROMs, customized gifts, pens, flowers, chocolates, cakes, sweets, toys, watches, handicrafts, art prints, perfumes, cosmetics, home furnishings, food items, health products.